By Zack Quaintance — This month there are quite a few titles from spring and summer appearing for the first time, books that launched with promise, settled in, and just now landed really memorable issues. I’d certainly put Action Comics #1004 and Submerged #3 in that category, both of which come from series I’ve liked from the start and was just waiting for a marquee issue to celebrate. Meanwhile, our Shout Outs for October is heavily weighted toward superheroes. I’m not sure how this happens (or why), but I will note our Best New #1 Comics of 2018 had more creator-owned books. This could all, of course, be happenstance. I should also note this wasn’t one of the stronger months for individual issues in recent memory, but a quick glance at November indicates that is soon to change. And now! On to the comics! I pointed this out recently on Twitter, but we are, indeed, lucky to have National Book Award winner Ta-Nehisi Coates writing comics. His work on both Black Panther #5 and Captain America #4 was outstanding, continuing to establish him as a massive talent increasingly confident within this medium. Shout outs as well to artists Daniel Acuna and Leinil Francis Yu. Coates, however, isn’t the only massive talent with two killer books in October. Jeff Lemire had Gideon Falls #7 and Black Hammer: Age of Doom #6, stellar works from great series. Props to Black Hammer guest artist Rich Tommaso and Gideon Falls’ Andrea Sorrentino for their contributions. Tony Stark: Iron Man #5 was a pleasant surprise in a series that is consistently fits that description. Writer Dan Slott and artist Gang Hyuk Lim incorporate (heh) Tony’s ethically gray younger brother in a one-off that foreshadows repercussions for the main plot as well. I’ve just found the futurism and corporate politicking angles in this run intriguing, so far. Shout out to Bryan Edward Hill and N. Steve Harris for concluding their run with Wildstorm: Michael Cray #12, which ends the story of the titular character, murdering his way (sympathetically!) through evil versions of the Justice League within Warren Ellis’ new Wildstorm Universe. Mark Russell is at it again in Green Lantern/Huckleberry Hound Special #1, which is set in the Vietnam Era, and told in a way that draws comparisons to now and leaves one feeling wistful for the integrity of Nixon and Watergate. Not much to say about Robert Venditti and Bryan Hitch’s Hawkman #5, other than carry on boys, what you’re doing with this character and book is refreshing and excellent. Meanwhile, Brian Michael Bendis and Ivan Reis’ Superman #6 was good, but Action Comics #1004 was better. Bendis’ dueling Man of Steel series are two of our favorite things at DC right now. More on that below. Our other favorite thing at DC? Scott Snyder, James Tynion, and some of the best artists in the business ongoing Justice League epic, which reads like a really smart big budget epic touching every corner of the DCU. 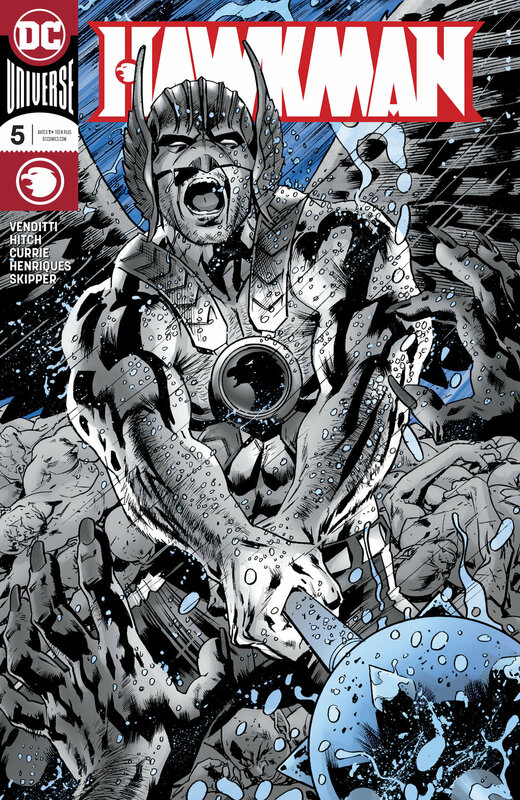 This month we get Atlantis, spread through a bevy of titles, including Justice League #9 and #10, Aquaman #41, and the Justice League Aquaman Drowned Earth #1 special. After Hot Lunch Specials’ first issue, I pegged it as a generational, Fargo-esque Midwestern noir, a comic that planned to deal in equal parts with a modern American immigration story and the sort of organized crime retribution that would be more at home in The Godfather. There is, to be sure, a fair amount of that stuff in this comic. Hot Lunch Special #3, however, serves up notice to readers that this book is headed for places they never expected. Every issue of this comic so far has been great, but this issue pushes the book to a new level, one of organic storytelling (not a food pun) that has me excited to see how this all ends up. I don’t know how to explain it that much better without revealing the twists. So, I’ll just say that Hot Lunch Special is a must-read comic, last month and from here until its end. 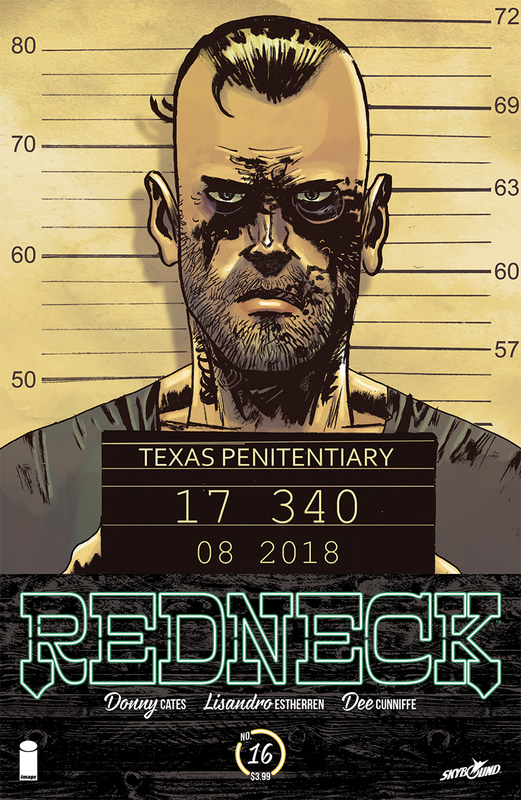 From its start, Donny Cates and Lisandro Estherren’s Redneck has been a neatly-constructed vampire romp, filled with Robert Kirkman-esque twists and a down home Texan accessibility Cates has honed. This issue, however, does something I wasn’t sure Redneck could: it goes to emotional places that are welcome and justified. In fact, in the parlance of this title, I’ll say I reckon’ Redneck #16 is a great representation of Cates’ biggest strengths as a writer. It has a scene in which Nazis are outlandishly thrashed in a prison (so cathartic) and another later on in which a son inadvertently/reluctantly comes out to his father, who meets the news with easy acceptance. I never get tired of that scene, and Redneck #16 nails it. There’s been a whole lot of blood in this book, but this is the first issue with a massive amount of heart (in retrospect that sentence was gross and I’m sorry). We wrote a Submerged #3 review, so we won’t rehash the many reasons we love this book too much, but we will note this issue made us even more interested in a title that has hooked us from the start. 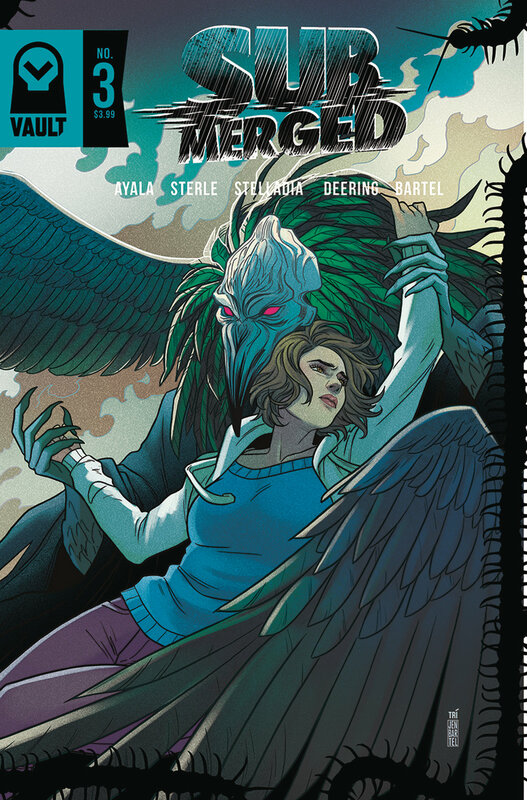 Simply put, Submerged #3 simultaneously takes us to the most fantastical places this story has gone while also rooting its stakes deeply in character. It’s a great mix for a wonderfully scary and introspective book steeped in personal experiences. Like many of Vault Comics other books coming out right now, this one is very much a must-read title. Simply put, Immortal Hulk #7 is the best superhero comic right now. I am far from the only comic critic to say this. Hell, it’s probably comic book critic Twitter’s favorite title so effusive have we been with our praise. Not that that means a book is unimpeachable, but what writer Al Ewing and artist Joe Bennett are doing here is truly special. They’ve taken a horror-laden approach to Hulk stories, which has been done before just not with this level of detail, imagination, and willingness to go to truly disturbing places. In this issue, the undead Hulk gets his comeuppance at the hands of the Avengers, who use a satellite from space to blast him into pieces somewhere in rural Iowa. Except, comeuppance is the wrong word. This title does a great job of making you feel sorry for everyone involved, which is perhaps the only correct way to handle stories about such a brutal, rage-driven figure. This issue hit me right in my personal life. In Action Comics #1004, Clark and Lois reunite after life has forced them apart. Now, my wife spent this summer in Washington D.C., covering federal immigration policy for the LA Times. Meanwhile, I was in California, working my own job, etc. In this issue, Lois and Clark pick up where they left off sweetly, almost as if nothing has changed, acknowledging that while neither can predict the future, their love is strong, even if their proximity must occasionally be distant. I found it true to my own experiences with such reunions, especially in tone. I’ve also been a reporter for a decade, and I like Lois quitting the newsroom. I’m not advocating for superhero stories going too far into media industry weeds, but having the most-celebrated journalist on the planet give up the lousy daily newspaper grind to write books is a logical move. Books are, quite frankly, what everyone I know at daily papers now aspires to write. Mileage will (and should) vary based on your own connections with these classic characters; I only speak for my experience with the material. Check out our Best New #1 Comics of October 2018 plus more of our monthly lists here.